It is said that “knowledge is the power” and the saying has the substance too. There was a time during human evolution period when the physical might and speed mattered to survive. In today’s world, better knowledge and skills are more necessary than the physical strength. If we needed to take just one example, we can remember Stephen Hawking, the famous scientist, who lost control on all his primary organs gradually till he reached middle edge. His brain was working at its full potential though. And, with the help of technology, he was able to do his physical activities, though in limited manner, and most importantly, continuing his research work. He used to give seminars and write books as well. He and his work gain the respect throughout the world and is considered as one of the most respected scientists. While, these days, there are many ways to earn the knowledge, but, magazines still remain one of the oldest and most reliable way to know about the latest happenings as well as remembering some of the important things from the past as well. Following this logic, we often talk about quality magazines that hit the news stand every month. And, we are very choosy about them. So far, we’ve talked about various issues of Reader’s Digest and Safari magazines only. Though, we feel sad that the English edition of Safari couldn’t survive, but we are happy that it’s Gujarati edition is running smoothly and is very popular amongst the readers. Let us talk about the August 2018 issue of Safari Magazine (Gujarati Edition) today. 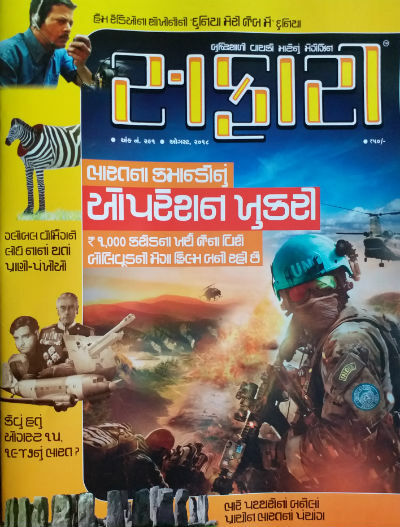 Majority of the cover page area is occupied by the representation of an article about Operation Khukri which looks nothing less than a poster of an action movie. The rest of the area has yellow to orange background with thumbnails and titles about some of the other interesting articles in this issue. The cover page is capable enough to raise curiosity and make you pick the magazine issue for sure. One of the most important part of a magazine (or for that matter, any media) which we often ignore is The Editorial. Editorial (if used properly) can work as a bridge between the reader and the editor. It not only helps the editor to share his vision for the issue and various articles inside, but also share his/her vision about various current happenings and some future plans too. Famous author, Nagandra Vijay wrote the editorial this month, where he talks about Ham Radio, and how it was an important part in some of the technological advancements. It also talks about how some decisions during the conflict times made American and Briton to stay behind in the technological advancements, and the countries like Japan grabbed the opportunity with both the hands, making it a far advanced country in terms of technology, especially electronics. It will show you the importance of vision a leader needs. India is an incredible country, and, no, just slogans don’t make it so. Just talking abruptly in superlative manner about the ancient civilization we had, where we talk about fantasies only; also don’t make it incredible. It is the set of real achievements, and landmarks the people living in ancient India, achieved, makes it so. In this series, a two page article about the time and astronomical calculation and devices found in ancient India is talked. How the basic things like stones and the shadow it creates due to the position of the sun, is used to calculate complex most things, will amaze you for sure. It also raises the curiosity in the reader to find out the possible way of moving placing heavy and huge stones (some of them are of 1.2 Matrix Tonne in weight!) during those days. It is a simple, small and must-read article. While we talk at length (rightly) about various operations, the Israeli commandoes, armed forces and Mossad have performed, we ignore talking about some of the kind of “Mission Impossible” carried away successfully by various Indian Forces, Agencies, Soldiers, Commandoes, Agents and Citizens. One such operation is Operation Khukri. There is a detailed (14 pages long) article penned down by Nagendra Vijay where talks about Operation Khukri. The article covers the background of the incidents which lead to this operation and how it was carried out on the foreign soil. Actually, the operation took place in Sierra Leone. India, directly doesn’t have any need to involve in the situations which lead some Indian soldiers to kept hostages there, and the operation was arranged and accomplish to get them back alive safely. Actually, the worst conditions in the country due to the easy availability of diamonds in the land and rivers there, lead to political and social unrest. And UN decided to intervene. The countries like America, Briton and others refuse to send their troops there by considering their safety from the brutal terrorists there who run an illegal chain of diamond selling and other stuff. India, and some other countries sent their troops there. How the things went on there and how India considered that there is no other way to get the Indian troops back, and it cannot rely on other countries to help in anyway to do so; is explored in this article in interesting manner. The tale is not less than an imaginative thrilling film, but, as it is said, truth is often stranger than the fiction; it is the reality. Famous Indian commandant, Field Marshal Sam Manekshaw once said, if someone says that: he is not fearful of death either he is lying or he is a Gorkha!. In this operation the Gorkha rifles and 18th Grenadiers were involved. Here are some of the quick links for you to follow to know more about various aspects of it. The Hollywood movie Blood Diamond explored the background of Sierra Leone Civil War, quite interestingly and it was praised for its authenticity also. You may like to watch the movie, to know more about the diamonds found there, and how it become a reason of unrest in Sierra Leone, and how brutal the RUF forces were. Global warming has many adverse effects on the species living on this planet. But, do you know that it affects the size of various species as well! Well, there is an interesting article which explores such stuff. And, it is studded with some example comparisons of various species living in cold and hot environment, and how their physical appearance reflects their living environment. The article is interestingly written, though mainly biology lovers will find it interesting, but, it is worth reading for everyone. India (that is Baharat) is going to celebrate its Independence day on 15th August, and Sushil Bhatia comes with an interesting article in this issue. Here he talks about various stuff as on 15th August 1947. The generation which witnessed the Independence day in its full consciousness is shrunk to almost nil now. So it would be nice to see some real pictures and account of various aspects as was on that day. The author talks about the following 8 aspects (and their status as on Independence day) in detail. Also, the way the things are distributed between India and Pakistan, is interesting to know about. And, we can understood the thinking of rulers of both the countries during those days through these incidents. A not to miss article. In addition, there are some small articles along with Q/A and FactFinder segments makes this issue rich with content. The article about Ham Radio (along with the information about several Ham Radio operators from Gujarat) is worth reading. It will make you feel that Ham Radio is probably one of the most underrated hobbies for whiz kids :). It is worth to say that the price of the issue is Rs. 50 (increased by 10 Rs. ), in order to cop up with rising prices of many related aspects. But, the magazine is much more worthy than the price.